The Cunningham children fear the conversation at the kids’ table will now likely revolve around their boring cousins’ schoolwork and church youth group. SCHENECTADY, NY—In a highly disappointing development expected to put a damper on the entire holiday weekend, sources within the Cunningham family confirmed Tuesday that none of the good cousins are coming to this year’s Thanksgiving gathering. According to sources, the news about Tyler and Lauren, from Mom’s side of the family, follows last month’s discouraging announcement that none of the good cousins on Dad’s side would be attending either—including Lindsey, Nick, and most notably Kelsey, who is older and who is highly admired for her stories about what high school’s like, as well as her knowledge of cool music. As a result, preliminary reports indicate the holiday will be dominated by less fun and more introverted cousins such as John, who barely talks and will probably sit alone and read a book the entire weekend, and Samantha, who is back from college and will likely hang out with Mom and Aunt Toni in the kitchen the whole time. 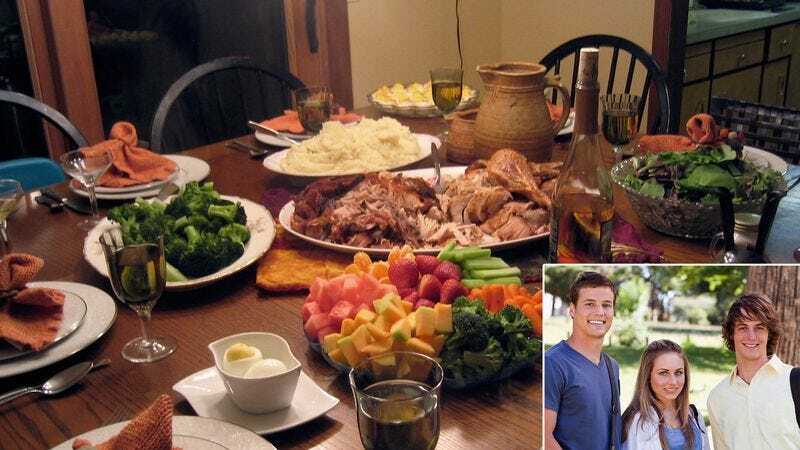 The Cunningham children described numerous disadvantages of the situation, saying that the kids’ table would be “really boring” this year without the good cousins, who like to joke around and make fun of Uncle Mike’s weird clothes. In addition, the outright lack of good cousins precludes the possibility of engaging in fun recreational activities while the adults all sit around and talk, with sources pointing out that in years past, Nick has brought his Xbox and all four of his controllers. Additionally, sources remarked that with none of the good cousins present, there wouldn’t be enough people to get a decent game of Apples to Apples going, even if the bad cousins were to join in, which they almost never do. “I don’t understand why we’re even having Thanksgiving here if none of the good cousins can come,” he added. At press time, the outlook for the holidays had become even gloomier following the late-breaking announcement that the Cunningham family would be driving six hours to Altoona, PA to spend Christmas with Aunt Toni and Uncle Mike, who don’t even have cable.